From tiny country clubs tucked in the hills to dirt links dropped next to highways, thousands of obscure golf courses decorate the United States, and each one has a family of golfers who affectionately claim it as their own. In one enriching six month period, Dave Marrandette navigated his motor home over 9,000 miles of interstate highways and back roads to find these gems. 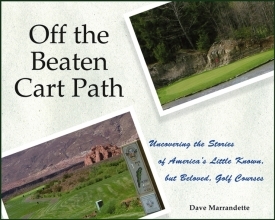 Off the Beaten Cart Path, the result of Dave s research, shares nineteen of the most enjoyable hidden courses Dave found—including one that runs through the infield of a horse track! The town whose entire population is employed by Winnebago Industries, Inc.
Off the Beaten Cart Path is for every golf fanatic who can appreciate salt of the earth courses that make up the American backbone of this great sport. For Love of Country Rio Mimbres Golf Course, Deming, New Mexico. The Gift Rochelle Ranch Golf Course, Rawlins, Wyoming. Down the Up River San Pedro Golf Course, Benson, Arizona. Golf and Garden Tools Santa Rita Golf Club, Corona, Arizona. America the Beautiful Sky Mountain Golf Course, Hurricane, Utah. Old Man River Suwannee Country Club, Live Oak, Florida. Après Ski Swiss Fairways Golf Course, Clermont, Florida. The Little Course That Could The Pines, Clermont, New Jersey. Aces and Eights Tomahawk Country Club, Deadwood, South Dakota. The Old West Turquoise Valley Golf Course, Naco, Arizona.